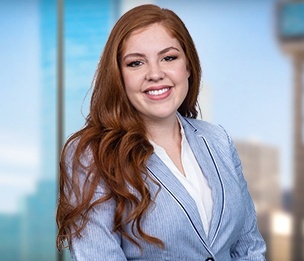 American Indian Law Review, Articles Editor, "Outstanding Comment"
Amelia Marquis practices general commercial litigation as an associate in Dykema's Dallas, Texas office. Amelia's primary focus is on matters relating to financial services and business disputes. Amelia graduated with honors from the University of Oklahoma College of Law, and served as an Articles Editor for the American Indian Law Review. The law review selected her published student piece as "Outstanding Comment." During law school, Amelia worked for all three branches of the federal government. She interned in Washington, D.C. with the United States House Committee on Agriculture and served as a legal extern for the United States Department of State in the Office of the Legal Adviser in International Claims and Investment Disputes. Amelia also worked as a judicial extern for the Honorable Judge Stephen P. Friot in the Western District of Oklahoma. Comment, "Sacred Rain Arrow: Honoring the Native American Heritage of the States While Balancing the Citizens' Constitutional Rights"